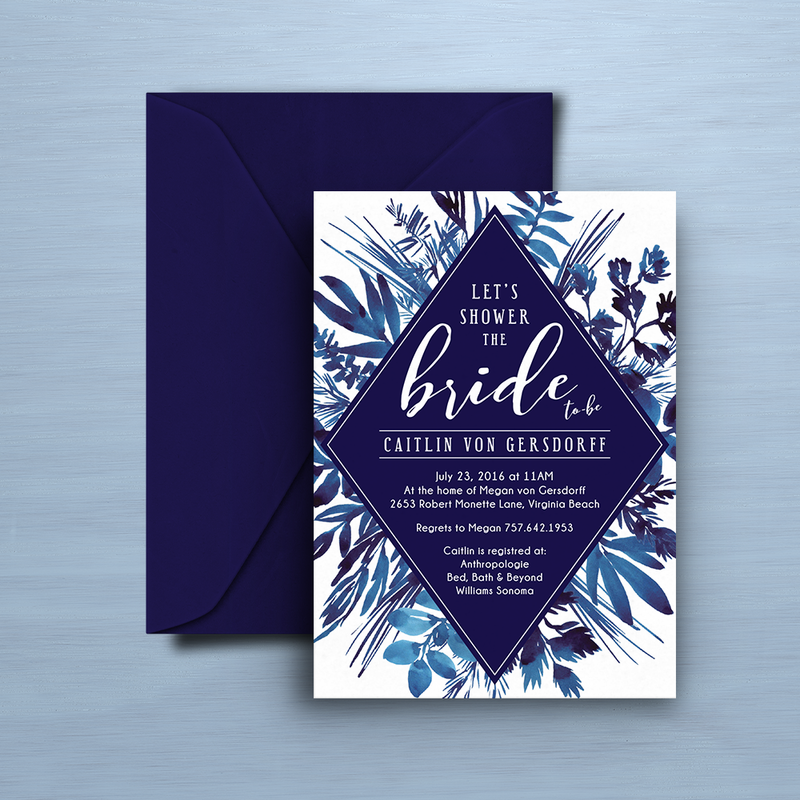 Thinking about your wedding invitations? 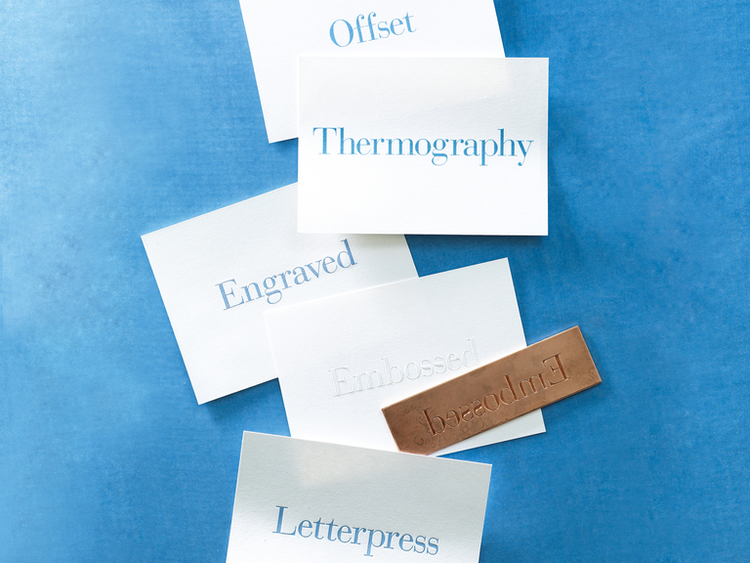 Here's a great article from The Knot that explains everything you need to know about letterpress, engraving and more. 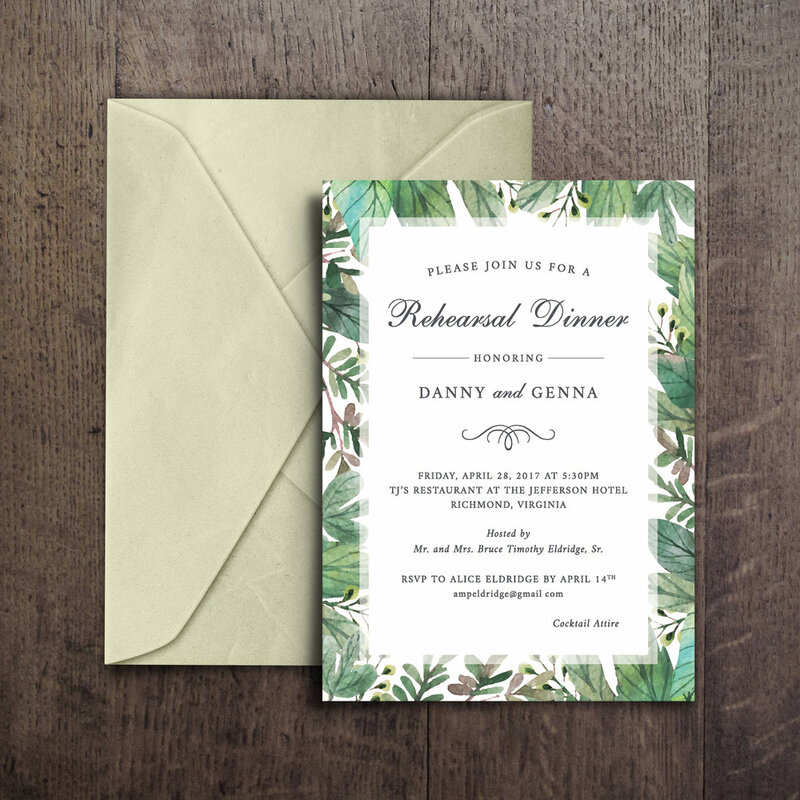 While your invitation wording and design hint at your wedding style, so does the printing process you choose—most notably, it conveys how formal your event will be. The way you choose to print will also have a big impact on your budget and, in part, dictate the paper type and the design. To help you choose a technique, read on for the rundown of all your options. What it looks like: The letters are raised on the front and indented (the bruise) on the back of the invite. Engraving is ideal for an ultra-formal affair (and has the price to match—it's one of the most expensive printing methods). How it's done: Ink is smoothed onto a copper or steel plate that's etched with your invite's text and design. The paper is then fed through a machine where extreme pressure (approximately 3,000 pounds) is placed on the paper, pressing it down around the letters and design. Paper pointers: Engraving generally works best on thick paper, like cotton fiber. (Flimsier stocks like parchment will break apart in the engraving process.) It's a great option if you're printing on colored paper, says Jessica Newfield of Dempsey & Carroll, a New York stationer known for engraving. Ink tips: The ink used is incredibly thick, so you can print a light ink on darker paper and it will still show up. While you can incorporate multiple ink colors with engraving, it's more time-consuming (and expensive), as each color requires its own plate and a separate pass on the printing press. Turnaround time: An engraved invitation order can take anywhere from two to six weeks to complete depending on the pinter and the proofing process. What it looks like: It's virtually indistinguishable from engraving, except that the lettering is slightly shiny and the back of the invitation remains smooth. And like engraving, thermography has a formal look (only without the hefty price tag). How it's done: Ink and resinous powder are heated and fused to create raised lettering. Paper pointers: Cotton fiber is usually a good paper option. Stay away from pearlescent or shimmery paper with thermography, advises Kerry Amidon of Checkerboard, an online stationer. The shiny combination won't look good together and will be hard to read. Ink tips: You're more limited in terms of color: Because this method fuses ink with powder, it's not as easy to get a pretty pastel hue; stick with lightly colored paper and darker ink. Also, Amidon says thermography is best for small graphics (like pattern)—full-color images won't come out well. Turnaround time: An order can be completed in just a few days, depending on the stationer. What it looks like: The letters are indented on the front and slightly raised on the back of the invite. The look is textural and sophisticated. It's normally used for traditional designs (but doesn't have to be) and is one of the priciest printing methods. That said, many stationers offer lower-priced letterpress lines—but with fewer options for customization. How it's done: Letterpress involves creating a custom polymer plate (in reverse), leaving only your invite design and lettering behind. The plate with the text and patterns is then hand-set and pressed into the paper. Paper pointers: Letterpress requires soft, bulky paper, so you're limited to thick card stock, like cotton fiber or bamboo paper (lines and details won't appear precise and patterns won't imprint well on thinner paper). Also, stick to white or light-colored paper and darker ink. The ink used for letterpress is thin, so white or pastel inks tend to look gray and dull on black or dark paper, notes Newfield. Ink tips: Stick to just one or two ink colors, especially if you're on a budget or have a tight timeline. Each color has to be pressed separately on the printer. Turnaround time: Depending on the stationer you use, an order can take anywhere from two weeks to two months. What it looks like: The results are similar to what you'd get from a home laser printer, but professional printers offer higher quality, so you won't wind up with the fading or smudging that you might get from printing them yourself. This process is ideal for more casual or funky wedding styles and for couples who are on a tight timeline or budget. How it's done: The printer uses thousands of tiny ink dots to form letters and designs on the paper. Paper pointers: Digital printing is typically done on thinner paper that's flexible enough to be sent through a printer. Few companies are able to print on thicker cotton fiber paper. Ink tips: While the ink won't appear as dynamic as it will using other printing processes, you can pretty much choose any color you'd like. Turnaround time: It's the least expensive and fastest printing option, requiring just a few days for production and shipping. What it looks like: Offset printing is similar to digital, but the quality is higher and it's slightly more expensive. The letters and designs are flat. It's a great budget-friendly printing method that works well with more casual designs. How it's done: Ink is transferred from an etched plate to the paper via a rubber-stamp-like instrument. Paper pointers: You get more paper options with offset printing than you do with digital, so if you're looking to use more textured papers like cotton or bamboo, you might choose offset printing. Ink tips: Designs and lettering will look more vibrant than they do with digital, plus you have free rein with your color and design choices. Turnaround time: It has a slightly longer turnaround time than digital—usually a few days to a week. Unlike digital printing, a custom plate is required and the ink is premixed beforehand. This adds a few extra days to the process. What it looks like: The paper-like foil leaves a metallic design behind. Foil stamping complements a luxe, romantic wedding, but it's also become increasingly popular for whimsical and casual invites. How it's done: A heated copper plate is used to push the foil into the paper, which leaves an impression much like letterpress. This printing process is considered "dry printing" because it doesn't actually use any ink. Paper pointers: Create a dramatic effect using lighter foils (like silver and white) on darker papers, suggests Emily Hostetler, founder and lead designer for Paper Moss. Keep in mind, though, that your design options are more limited because thin, delicate lines won't show up very well. Too much foiled text is difficult to read, so it's best to restrict it to key words, borders or intricate designs, notes Smock designer Sarah Walroth. Ink tips: It's not ink, per se, but know that a little goes a long way. Turnaround time: Foil stamping is the most expensive printing process and is often outsourced, which means a longer turnaround time (and most stationers can't do rush orders on foil stamping). The process can take around 10 business days with a stationer who does the stamping in-house—but up to two months if they send it to a printer who specializes in foiling. What it looks like: Think of it as engraving but on a slightly larger scale. Letters and images appear raised but colorless. It's perfect for monograms and bordering. The look is subtle yet modern. How it's done: The paper is pressed between two etched metal die to create a "relief" surface. Paper pointers: Embossing is typically done on thicker paper stock like cotton fiber so that the designs show up with crisp lines and impressions. Ink tips: Inkless embossing (or blind embossing) is a popular choice for a delicate touch. Adding colored ink is also an option, but it could limit the flexibility of your design. Turnaround time: Because embossing is very similar to letterpress and engraving, it generally takes about the same amount of time to print, which, again, depending on your stationer, takes about three to five weeks. Dandy Designs is a small graphic design company that provides custom designs and printing services.